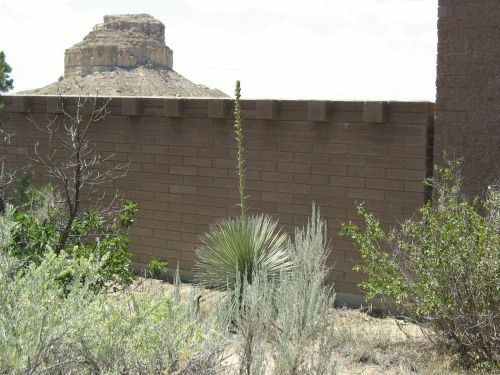 In between a bunch of depressing news about budget cuts, the latest edition of Southwestern Archaeology Today links to a couple of interesting articles with considerable relevance to Chaco. One is about turkeys; I’ll do a post on it later. The other is a column by Marc Simmons in the Santa Fe New Mexican on Pueblo clothing and how it has changed over time. Interestingly, in my experience visitors to Chaco don’t actually ask about clothing very often. 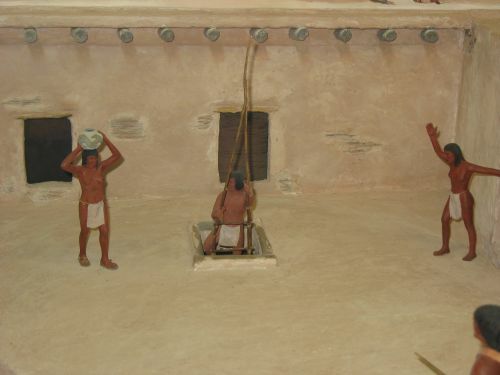 This may be due to the influence of a diorama in the visitor center museum which seems to answer any questions they might have, since it shows people in the course of various daily activities attired in loincloths and little else, which is pretty common for “Indians” in museum dioramas. 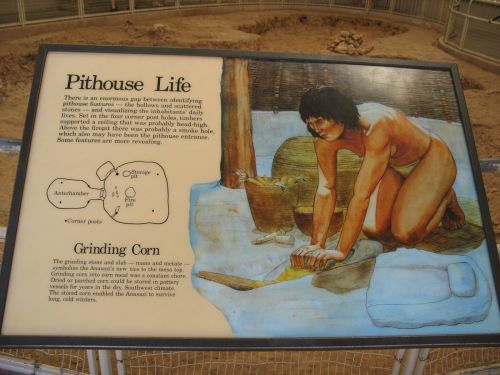 This “all loincloths all the time” interpretation is also common in artists’ renditions of “what life was like” on interpretive signs at many parks. There aren’t many of these signs at Chaco, but they are quite common at some other parks such as Mesa Verde. This all has a powerful effect on people’s perceptions, I think, because visual impressions are both stronger and more vivid than anything that can be explained in words. Indeed, a woman once asked me, referring to the diorama, why the Chacoans had worn anything at all. To this day I’m not sure what preconceptions she was bringing to the diorama, but clearly its implication that “the Indians” didn’t wear much had led her down that cognitive path. 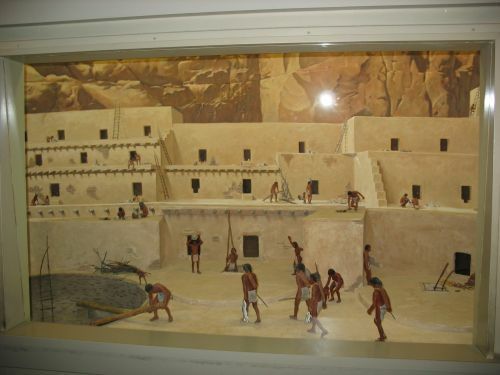 This strong effect of the visual image is unfortunate, however, because quite a bit is known about how the Chacoans probably dressed, and all the evidence available strongly indicates that the diorama is totally wrong. But back to Simmons. He’s one of the most renowned historians of New Mexico, and I’ve mentioned him before for his excellent book on the history of Albuquerque. His specialty is the Spanish colonial era, so his column on Pueblo clothing draws most of its information from Spanish documents. Those documents begin with the earliest exploratory expeditions in the sixteenth century, and they are generally thought to be pretty reliable in their descriptions of the people the explorers encountered. 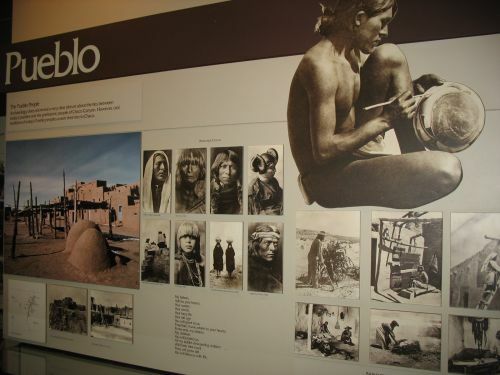 The main thing that impressed those explorers about the Pueblos was how “civilized” they seemed in comparison to the hunter-gatherer groups they had seen further south. 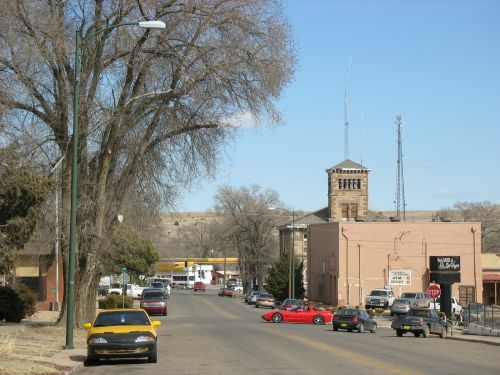 Indeed, the name “Pueblo” itself, deriving originally from these reports, refers to the people’s settlement pattern based on large, permanent towns. Similarly, the main comments the chroniclers had about Pueblo clothing were about how substantial it was. Men typically wore kilts, and women wore a type of dress known as a manta, made out of large square pieces of cloth. The main material used was cotton, which was grown in the low-lying river valleys, especially in the Rio Abajo region at the southern end of the Pueblo domain, and traded to the villages in areas where cotton can’t be grown. This cotton was woven into cloth, always by men, and often in ceremonial contexts in kivas or other important spaces. The Spanish also remarked on the use of tanned buckskin or gamuza as an alternative material for clothes, especially nice during the cold winters. Another item useful for keeping warm was the rabbit-fur coat, made of strips of rabbit hide woven together by women. Footwear consisted primarily of leather moccasins known as teguas. This information comes from a few hundred years after the fall of Chaco, of course. A lot had changed in Pueblo culture during that period, so it would definitely be a mistake to simply project the Spanish reports back in time. Luckily, we don’t have to. Due to the good preservation at Chacoan sites, and the even better preservation at the cliff dwellings occupied slightly later, many examples of clothing have survived, though generally only in fragmentary condition. These materials largely substantiate the Spanish accounts: Cloth is typically made out of cotton (probably underrepresented in the archaeological record because it doesn’t preserve very well), and cloaks made of woven rabbit fur and turkey feathers are common. The moccasins and leather garments are not generally found, however. 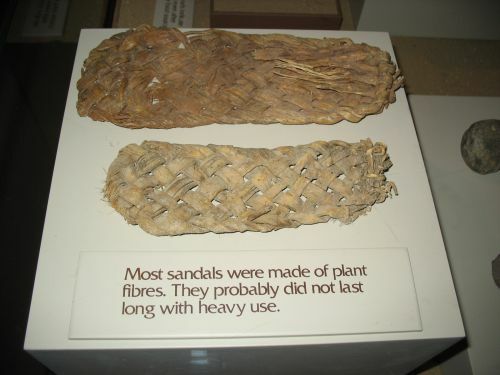 There is no shortage of footwear, but it takes the form of sandals made of yucca fibers. These are very common and there are some indications that they may have had ritual importance in addition to their everyday use. Leather moccasins during this period are rare to nonexistent in the Chacoan area, but common among the Fremont to the north in Utah, and they are even considered a diagnostic feature of the Fremont culture. At some point between the fall of Chaco and the Spanish entradas, then, leather clothing and footwear seem to have been adopted by the Pueblos. 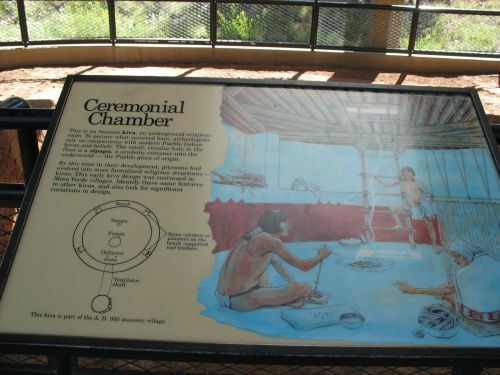 One theory to explain this, along with various other changes in Pueblo society during this period, links it to increased contact with Plains groups starting in the fourteenth century. Another theory sees the adoption of leather clothing as associated with a prolonged period of climatic cooling, perhaps associated with the beginning of the Little Ice Age. These two theories are not mutually exclusive, of course, and I think they actually complement each other nicely. 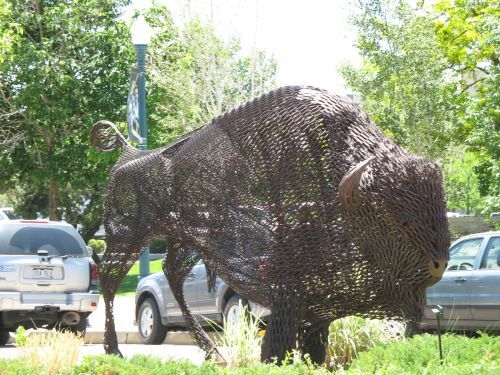 One proposed way of tying them together is a model in which cooling weather on the southern Plains leads to bison beginning to venture further south than they had before, which leads bison-hunting Plains people to follow them and come into contact with the Pueblos, whose increasingly efficient irrigation agriculture gives them surpluses of crops that they can exchange for meat, hides, and other bison products. It’s notable that trade networks during this period seem to be oriented along an east-west axis connecting the Pueblos to the Plains, whereas trade during earlier periods seems to have been more north-south and connected to Mesoamerica. Of course, this theory is by no means universally accepted, and there are other ways to interpret the changes in Pueblo material culture during this time. Still, coming back to clothing specifically, I think all of this shows that the “Diorama Indian” loincloth-based attire has more to do with the preconceptions of the people who made the dioramas than with what people at Chaco and elsewhere actually wore.